In Harlem, a vitriolic pastor leads a 'trial' that ends in the conviction of the president. Who knew? 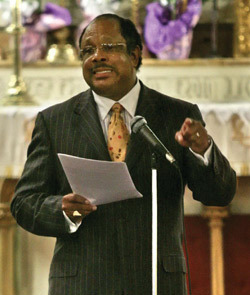 Harlem pastor James David Manning put President Barack Obama on "trial" in May on charges including treason, sedition, and, most importantly, not being a "natural-born" United States citizen, thus making him unqualified to hold the office. The verdict was both convincing and resounding: Manning proved himself guilty of first-degree irrelevance. Had the trial and pre-ordained "convictions" of Obama, former Columbia University President Michael I. Sovern and the school itself on 17 criminal "counts" simply been presented as a mock trial intended to stir intellectual discussion, they might at least have provided grist for idle cocktail party banter. But the sheer silliness of the proceedings, punctuated by Manning's histrionic insistence that his trial was "legal" and its verdict "binding," erased even that forlorn hope. After leading 40 to 50 people on a march around the Columbia campus, Manning spent the rest of the first morning getting people through metal detectors and into the building, said Salon.com's Alex Pareene, the only reporter from a reputable U.S. media outlet to attend. As soon as the 75 or so spectators (Manning had expected 30,000) were finally settled in, the proceedings broke for lunch. It went downhill from there. Manning evidently failed to properly coach prospective "jurors" on how to handle the faux "voir dire" process. Manning "was trying to get them to say they would be impartial," Pareene said. "He'd ask, 'If evidence were provided that [Obama] was innocent, could you find him innocent?' At first, they kept saying, 'No, I think he's guilty.'" Manning named Columbia and Sovern as "co-defendants" for supposedly enabling Obama to fake attendance at Columbia in the early 1980s, when Obama really was a CIA operative training in Al-Qaeda terrorist camps in Afghanistan and Pakistan. (Actually, Al-Qaeda was formed in 1988 at the earliest.) Manning, who did not respond to an interview request from the Intelligence Report, had not released a transcript of the proceedings as of early July. But in a video excerpt of the trial posted online, Manning introduces some of his evidence "proving" Obama never attended Columbia: In his autobiography Dreams From My Father, Obama writes that he arrived in New York inquiring about an apartment "in Spanish Harlem," near the university. But, Manning declared, the Columbia campus is on Manhattan's West Side, while Spanish Harlem is on the East Side. Aha! The president doesn't appear to be at serious risk of being perp-walked to the hoosegow in handcuffs with a jacket covering his face. Indeed, Manning in a post-trial press conference grudgingly acknowledged that his "court" lacked authority to execute arrest warrants and warned that the verdict should not be used by anyone as an excuse to "attempt to effect an arrest of Mr. Obama." Manning has been a dedicated "birther" conspiracy club member — and, as an African American, a somewhat unique one — since that bandwagon began rolling in 2008. From video recordings made before and after the trial, it appears Manning hoped his exercise would validate numerous "indictments" handed down by so-called "citizen grand juries" of the antigovernment "Patriot" movement. Citizen grand juries evolved from the "sovereign citizen" movement, a movement that contends that individuals can opt out of the jurisdiction of federal and state governmental authority and create, among other things, their own courts. Aside from a few obscure website mentions, Manning's "verdict" appears to have landed with a dull thud, even among the Patriot faithful. In the weeks since, Manning seems to have drifted into increasingly bitter ideological isolation. In a June 10 Web post, the pastor disparages not only Obama but Republicans, Democrats, Tea Partiers, the "dung head" (mainstream) media, Bill O'Reilly, Glenn Beck, Congress, and California political hopefuls Carly Fiorina and Meg Whitman, among others. The last good guys in Manning's bizarre world are "high-ranking U.S. military officers" supposedly poised to arrest Obama in a coup d'état. Alas, until they act, Manning will labor on trying to prove Obama has pulled the wool over virtually everyone's eyes but his own.